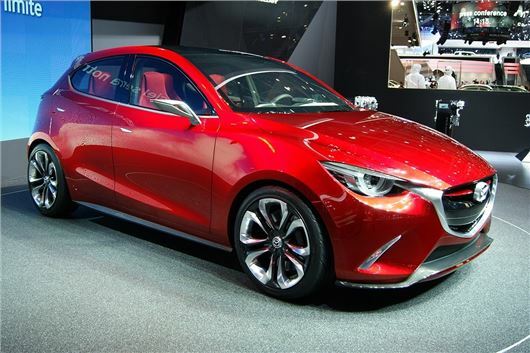 The Mazda Hazumi concept, which previews the next generation Mazda2, has been unveiled for the first time at the Geneva Motor Show. Due next year, the new Mazda2 will take styling cues from the Mazda3 and the concept shows that it's a styling theme that works equally well for the smaller car. The next Mazda2 will get existing petrol engines along with the new 1.5-litre Skyactiv-D diesel designed for low fuel consumption and CO2 emissions of less than 90g/km. This engine will also be used in other Mazda models including the Mazda3 and CX-5. In the cabin there’s an infotainment system with smartphone connectivity and a stylish interior design. The centre console is ‘suspended like a bridge’ between the doors and the instrument binnacle features a single large dial, displaying all important information. The styling is dramatic, but it doesn’t look like too distant of a dream. A production car will have larger wing mirrors, smaller wheels and less intricate detailing, but the overall style of the next Mazda2 should be very similar to this concept. The name Hazumi means 'spring-up' in Japanese as Mazda says its new hatchback is bursting with energy and built with 'no compromises to Mazda's engineering principles'.